Previous research into the global land use impacts of biofuels has assumed that cropland area could expand in most regions of the world. Such estimated expansion into more carbon-rich land cover such as grasslands or forest is the focus of recent research into the contributions of indirect land use changes (ILUC) to the GHG impacts of biofuels. Many studies have examined the global land use consequences of biofuel production [1–7]. 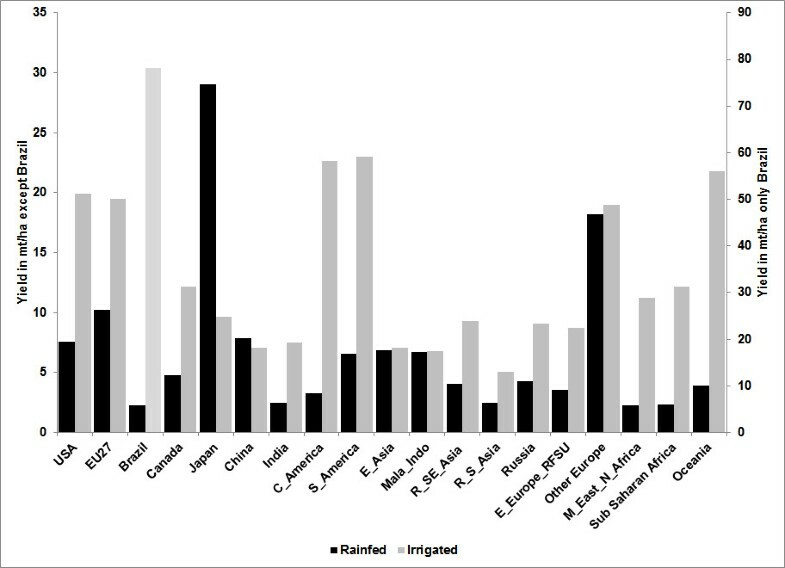 However, all of these studies have ignored the role of irrigation. 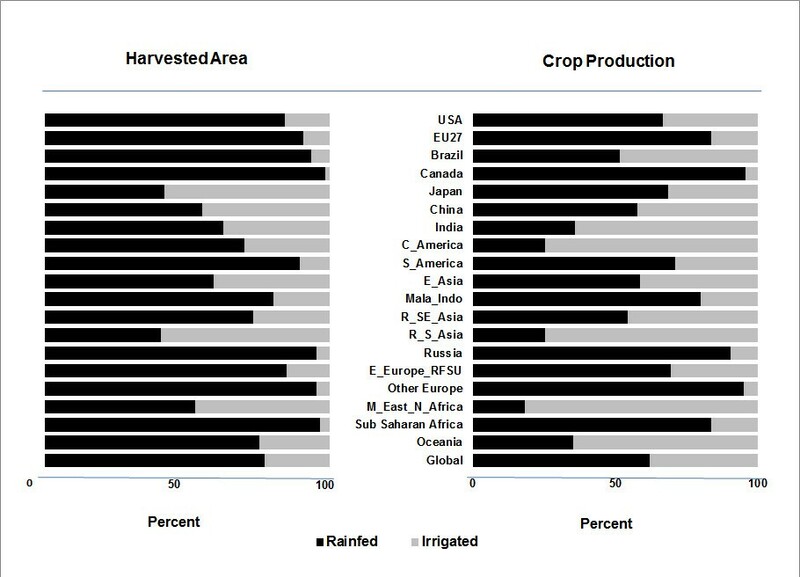 We find that this omission introduces systematic biases in the measurement of the size and pattern of global land use changes and therefore the land use emissions due to production of biofuels. Land use changes and their consequent emissions induced by crop expansion due to biofuel production have proven to be a controversial topic, resulting in a rapidly proliferating literature. The early papers suggested that biofuel production could have extraordinary land use implications [2, 14–16]. For example, Searchinger et al. provided the first peer-reviewed estimate for the ILUC (about 0.193 ha of new cropland area per 1,000 l of ethanol capacity). 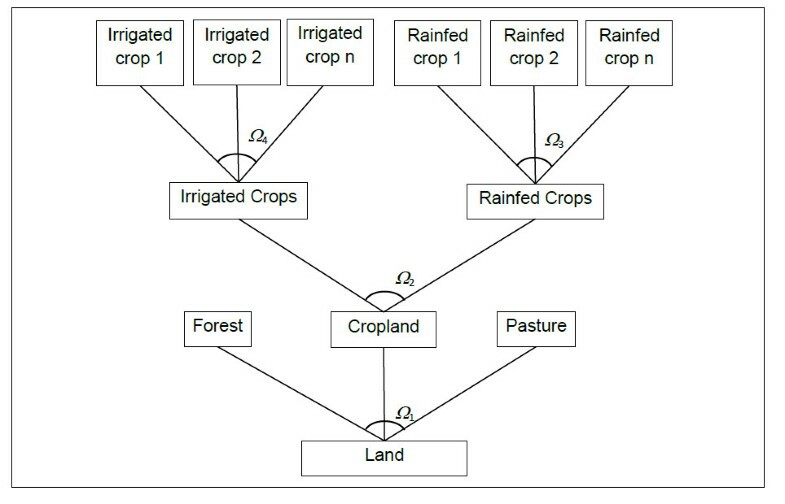 Those authors used a partial equilibrium modeling framework (FAPRI) to assess the ILUC due to the US ethanol program. However, the more recent studies find that the early estimates have overstated the land use implications of US ethanol production [5, 6, 17–21]. For example, Hertel et al. using a general equilibrium model showed that full accounting for market-mediated price responses to ethanol production, as well as the geography of world trade, contributed to significant reductions in estimated ILUC impacts. Those authors estimated that the ILUC for the US ethanol program is about 0.077 ha/1,000 l of ethanol. Research studies in this area have highlighted and discussed key factors in determining the land use impacts of biofuels and their geographical distributions. 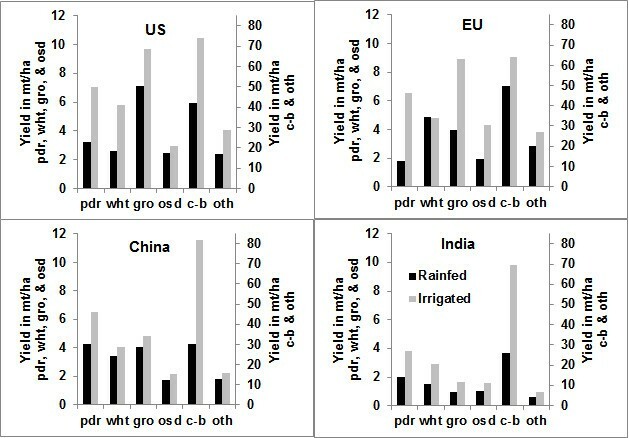 Several papers discussed the importance of yield response to crop prices and extensive margins [2, 6, 17, 22, 23], the market-mediated factors which affect the land use impacts of biofuels [4, 15, 17, 18, 21], and the role of international trade and its importance in determining the geographical distribution of land use changes [2–4, 18, 21, 24]. The interactions between livestock and biofuel industries and the role of biofuel by-products are another important dimension of this problem and are the focal point of the THT model upon which the current analysis is built. The model provided by these authors is not the latest version of GTAP-BIO, but it has almost all modifications which are confirmed through a peer-reviewing process. Intimately related to these estimates of land use changes are the associated implications for emissions induced by land cover change coming from increased biofuel production. Wicke et al. compare these estimates and find that the most recent estimates for the land use emissions are significantly lower than the earlier estimates. For example, land use emissions due to the US ethanol program have followed a downward path from more than 100 g/MJ  to less than 14.5 g/MJ . Most of these reductions have resulted from better measurement of the various margins of biophysical and economic response to increased biofuel production. 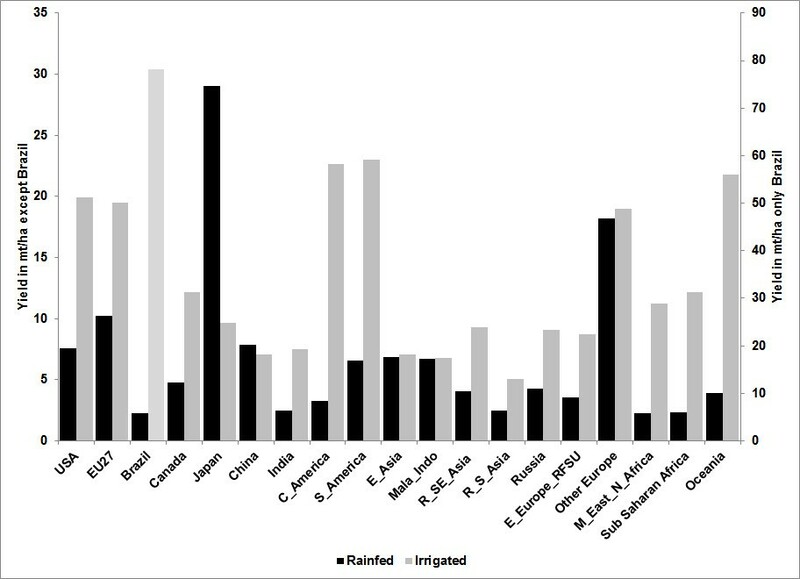 However, all of these studies have ignored the role of irrigation constraints in their analyses. 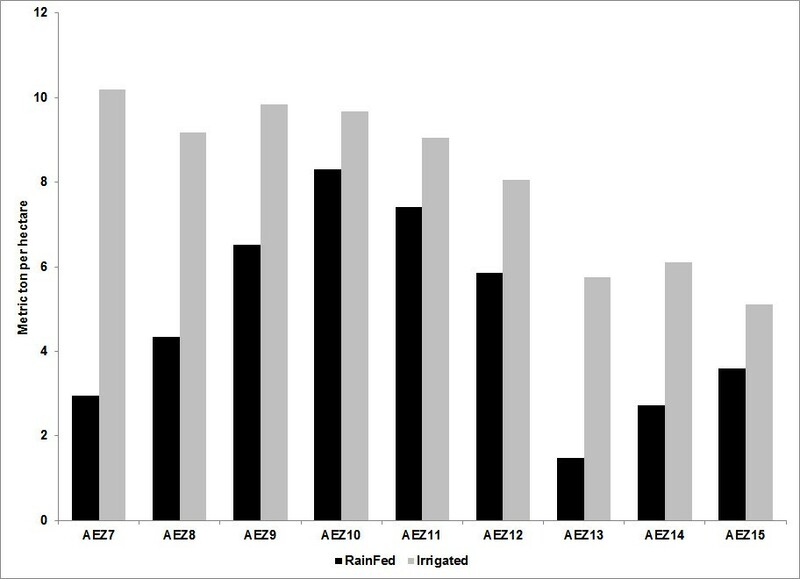 Indeed, despite the extensive work to date seeking to better understand the land use implications of biofuels, no attempt has been made to examine the role of irrigation in biofuel-induced cropland expansion. 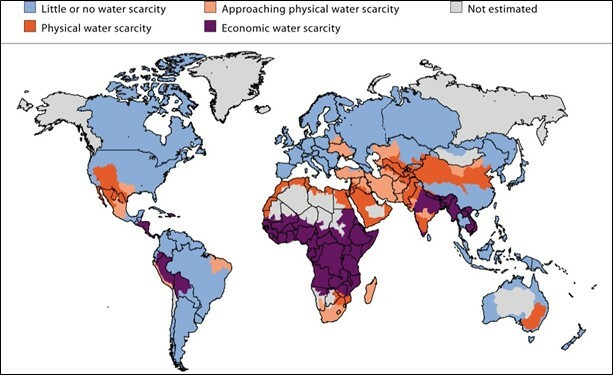 Nevertheless, some studies [26–28] have examined water implications of producing biofuels at regional and global levels. 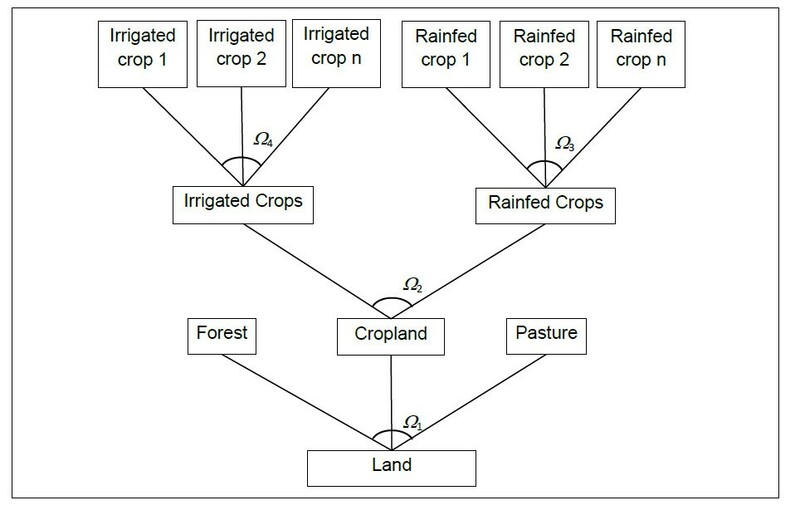 S 1 k = P F k P S wheat Q F 1 k Q S 1 = P F k P S wheat Q F 2 k Q S 2 = S 2 k for all k ∈ non - land inputs . ∑ k ≠ land K S 1 k = ∑ k ≠ land K S 2 k .
S 1 land = P F 1 land P S wheat Q F 1 land Q S 1 = P F 2 land P S wheat Q F 2 land Q S 2 = S 2 land .